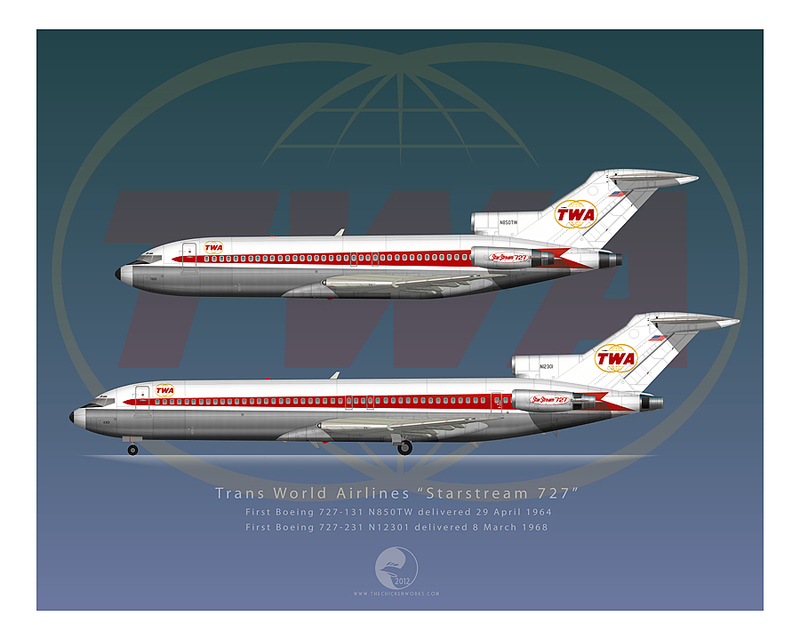 Thread: PRINT: Trans World Airlines Boeing 727-100 & 727-200 "Starstream 727"
TWA launched its first jet services on 25 January 1959 between New York Idlewild-San Francisco with the Boeing 707 in competition with American Airlines' launch of 707 services between New York Idlewild and Los Angeles. Howard Hughes pushed TWA's finances to the limit to get into jets and while the arrival of the Jet Age to TWA marked the beginning of its zenith, it also laid the groundwork for Howard Hughes' eventual exit from TWA despite the near-limitless capital that he could access from his own parent company, Hughes Toolco. In February 1956 he ordered eight Boeing 707-120s, then followed in June 1956 with an order for 30 Convair 880s, and then 25 more Boeing 707s in May 1957. The value of these three orders was $300 million for the 63 jets, quite a large sum for those days. TWA raised additional funds with a one-to-one stock offering underwritten by Hughes Toolco that also gave Hughes 77% control of the airline. But the money raised from the stock offer wasn't enough and it looked like TWA couldn't meet its payroll obligations for the first quarter of 1958- Hughes borrowed $12 million from the banks, but at this point, one of TWA's original 1945 backers, Equitable Life, wanted a long term financing plan for the 63-jet order as it was getting nervous about Hughes' borrowing to meet basic costs like payroll. To ease the creditors, Hughes had Toolco accept the obligations for the jet order who in turn would lease the aircraft to TWA. Aircraft orders were swapped with Pan American (something that pained Hughes to have to approach his rival Juan Trippe to help TWA out) and the Convair order was cut to 20 aircraft. It still wasn't enough and some of Hughes' banks cut off his credit in March 1960. With the other creditors, a short term financing plan was arranged to allow TWA to keep operating provided Toolco assumed all financial liabilities for the airline as long as there was a change in management at TWA. To further put the brakes on Hughes, his shares in TWA were put into a voting trust which essentially (and controversially for the day) locked out Hughes from the airline. While a financing plan agreeable to all the parties was eventually settled upon at the end of 1960, Hughes still found himself shut out of TWA and for six years lawsuit and countersuit after another were filed as he tried to regain control of TWA. He would finally give up in 1966 when in May of that year Hughes Toolco sold off its entire share of TWA stock and he was out of the airline business for the time being - four years later he bought Air West, but that's a topic for an upcoming print! Despite the legal battle over leadership and control over TWA, the airline still held gravitas in the airline market and with the traveling public, managing to overtake Pan Am in 1969 in numbers of passengers flown across the Atlantic. Despite Hughes' virtual ouster in 1960, TWA's managers realized they had something that rival Pan Am didn't- a domestic route network and it was high time on the heels of the launch of 707 services to bring short haul jet service to TWA's network. 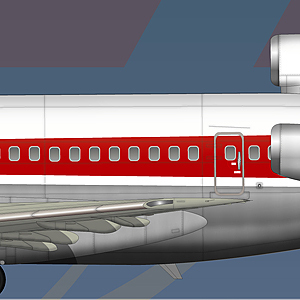 In 1961 TWA had ordered 10 Sud-Aviation Caravelles that would have been powered by GE aft fan CJ805 engines, but that order was canceled in May 1962 when Boeing's 727-100 offered greater promise; in fact, TWA had already ordered the Boeing 727-100 (10 aircraft) in March 1962 while it still had the Caravelle order in place. The first 727-100 services started on 1 June 1964. With the 727-100 and the new Douglas DC-9 now flying short/medium jet services, in March 1968 TWA added the larger Boeing 727-200 to its fleet. 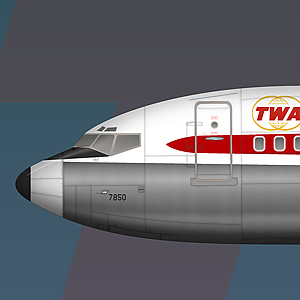 Over its history, TWA's 727s were a vital backbone of its fleet with a total of 36 727-100s and 78 727-200s operated total. 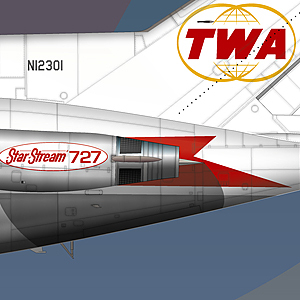 This particular print depicts N850TW, TWA's first 727-100, and N12301, the airline's first 727-200 in their delivery colors with the "Starstream 727" logos on the nacelles. This print is 16 x 20 inches in size with a white border and is printed professionally on heavyweight paper in a high gloss finish that uses a subtle pearlescent photographic process that makes the colors more vibrant than most print processes. I also have this print in an 8x10 size for those wanting a smaller print. Prices will be $40 for the 16x20 inch size and $15 for the 8x10 size. Pure classics...oh how I miss the 727! Beautiful work Doc!! Well done!! I'm a total noob in these forums, so if I'm out of line... please ignore or delete as necessary. 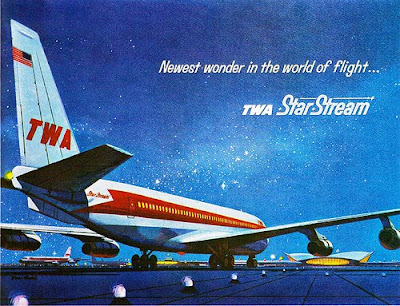 But the official brand appears to be "Star Stream" as two words, each capitalized, as in the logo and official TWA advertising. Seeing "Starstream 727" on this print makes me twitch just a bit. On another note, holy crap you do great work! Um ok! Did you get the memo. Kidding! I see what you did there. LINEAS AEREAS MEXICANAS, S. A.